I honestly cannot wait to share this 809 at Vickery wedding in Fort Worth Texas with ya’ll! Not only did we get to work with one of the most laid back and trusting couples, but it was even published in "The Knot Texas Magazine" for their 2017 Fall/Winter issue!! (How exciting is that!?!) See the article and other published weddings here. I first meet with Audrey & Paul at Coffee Shop in Fort Worth and quickly realized I was going to LOVE working with them. I remember at our first meeting I thought the meeting was just flying by and quickly realized we had been talking for 2 hours! They did not have much direction, but knew they loved industrial style weddings, and wanted there to be plenty of GOOD FOOD and ALCOHOL, and I am glad to say I think we succeeded! 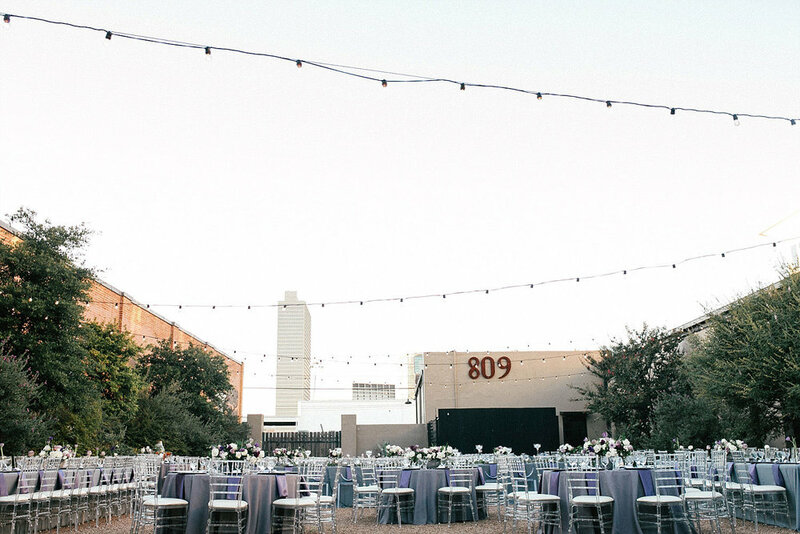 The first thing on our list was to find a venue and set a date, and we quickly realized that 809 at Vickery would be the perfect industrial venue for their wedding. 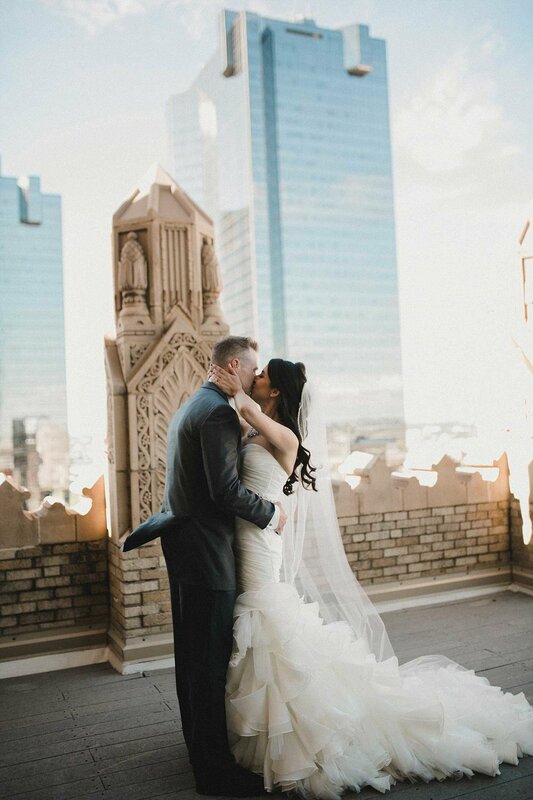 They loved the white brick walls, café lights, and large exterior courtyard with downtown Fort Worth in the background. 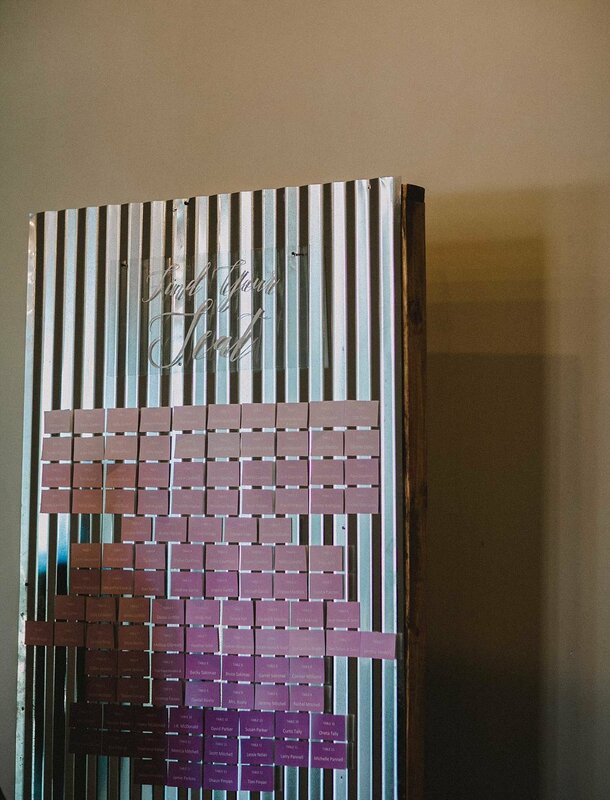 When we began the design phase of planning, I wanted to create a design that not only reflected the bride and groom’s style, but also the industrial theme, and as a result, the “Industrial Glam” wedding theme was born! To check out more about 809 at Vickery check out our blog post about Fort Worth Wedding Venues. Audrey & Paul got married in the interior reception hall of 809 at Vickery in front of the white brick walls with hanging stands of café lights and a large display of white pillar candles. While pillar candles decorated the aisle. It was the perfect setting for an industrial wedding ceremony! After the ceremony as the couple took pictures, guests signed a picture book of the couple and enjoyed drinks Moscow mules at the bar. The reception was held in the exterior courtyard of 809 at Vickery, and it was honestly one of the most break taking receptions yet! 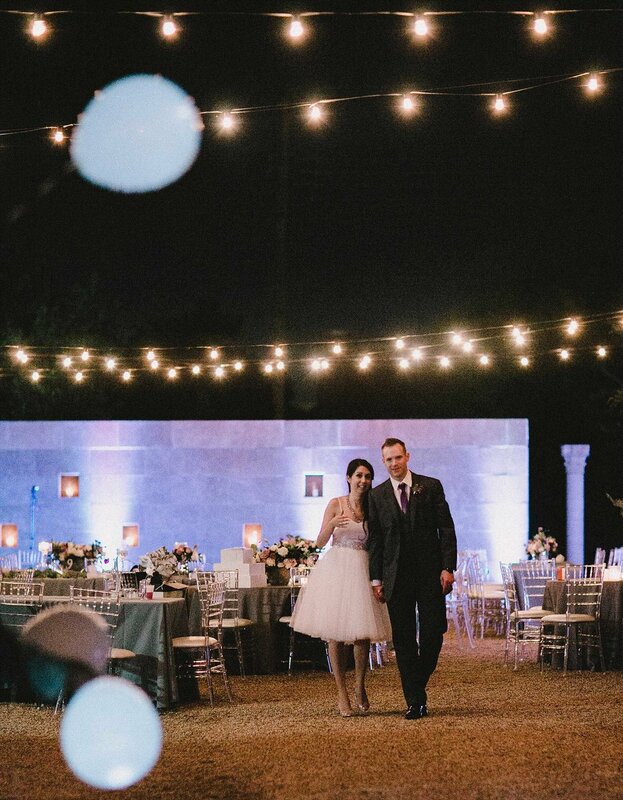 As soon as guests walked outside into the reception there were overhanging strands of café lights, and the 809 at Vickery courtyard was filled with a mixture of round and long tables. At the center of the reception was the head table with a long seeded eucalyptus garland and the bride and groom’s ghost chairs were labeled Mr. & Mrs. All the tables had gray linens and an acrylic table number, and each place setting had a silver charger, menu with geometric designs, and ghost chivari chairs. 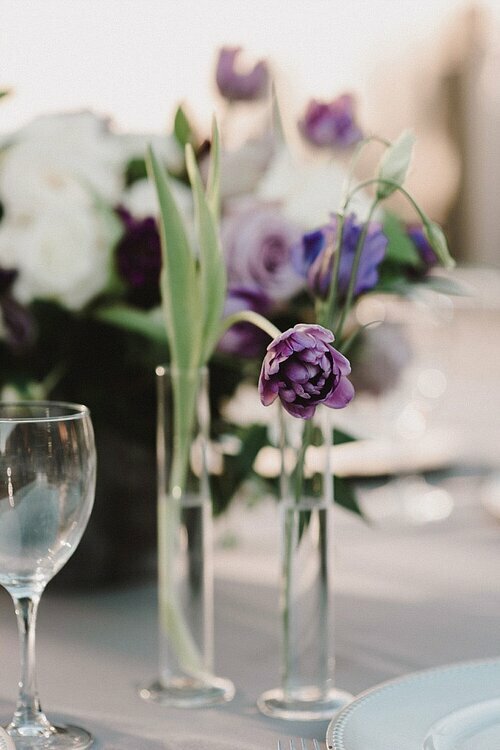 The florals were a mix of lavender, plum, and white flowers and were placed in large concrete vases to go along with the overall theme. As the night went on the guests danced the night away with music from Everlasting Sounds that kept everyone on the dance floor the entire evening. 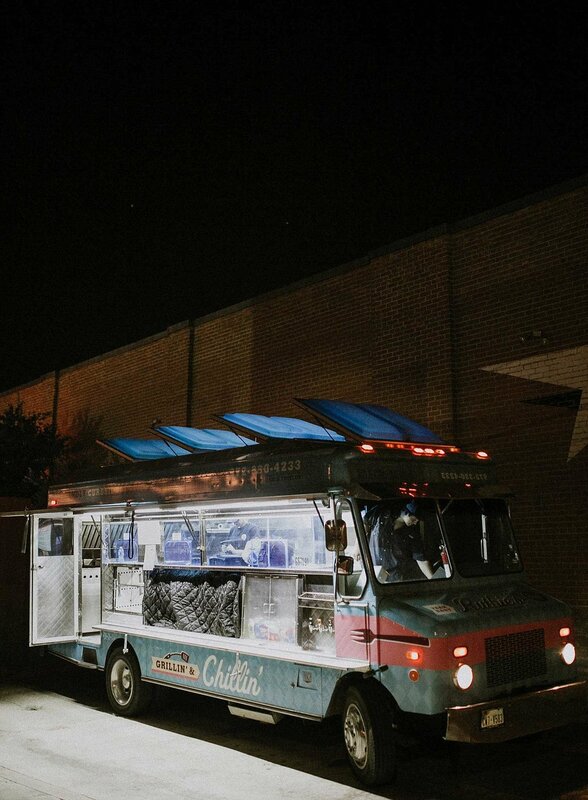 After cake cutting guests then had a surprise late night snack from Ruthie’s food truck (Which was honestly the bomb just saying!!) When it was time to leave guests held LED balloons and the bride and groom kiss under a tunnel of lit-a-loons. It was the perfect end to a beautiful and fun night!